Richard Dawkins on the Colbert Report, discussing his new book "The God Delusion". Magnificent stuff. ps For those of you not familiar with Stephen Colbert and get confused watching this, you're not alone. Tom Delay thought Colbert was real and referenced him on his defence website as a supported because of his "hard-hitting" interview with Robert Greenwald ("who hates America more, you or Michael Moore?"). "STAR WARS" or Your ETERNAL SOUL??? I'm afraid that, as compositor on the infamous Flying R2-D2 shot in Episode II: Attack Of The Clones, I'm going to have to accept some of the responsibility for this. called The Star Wars that is beloved by millions. but Satan's Battleground for their very souls!" 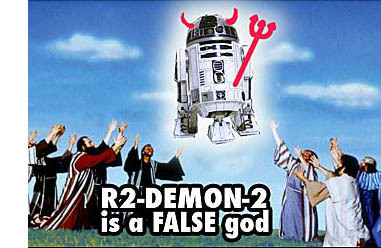 The FORCE is a tool of SATAN! "It's not JOKE - if you believe in The FORCE, you will go to HELL"
"Darwin's Rottweiller" Richard Dawkins is interviewed in Salon and it's well worth a read. SALON: What do you do with consciousness? I mean, do you really think the mind is totally reducible to neural networks and the electro-chemical surges in the brain? Or might there be something else that goes beyond the physical mechanics of the brain? DAWKINS: Well, once again, let's not use the word "reducible" in a negative way. The sheer number of neurons in the brain, and the complication of the connections between the neurons, is such that one doesn't want to use the word "reducible" in any kind of negative way. Consciousness is the biggest puzzle facing biology, neurobiology, computational studies and evolutionary biology. It is a very, very big problem. I don't know the answer. Nobody knows the answer. I think one day they probably will know the answer. But even if science doesn't know the answer, I return to the question, what on earth makes you think that religion will? Just because science so far has failed to explain something, such as consciousness, to say it follows that the facile, pathetic explanations which religion has produced somehow by default must win the argument is really quite ridiculous. Nobody has an explanation for consciousness. That should be a spur to work harder and try to understand it. Not to give up and just say, "Oh well, it must be a soul." That doesn't mean anything. It doesn't explain anything. You've said absolutely nothing when you've said that. Can you believe he said that off the cuff?